If you've seen my latest post on PreK + K Sharing, you may know that I've had a recent spurt of creativity making discovery bottles. I had one or two that I wanted to try, and a couple that were already on the shelf that needed a facelift. 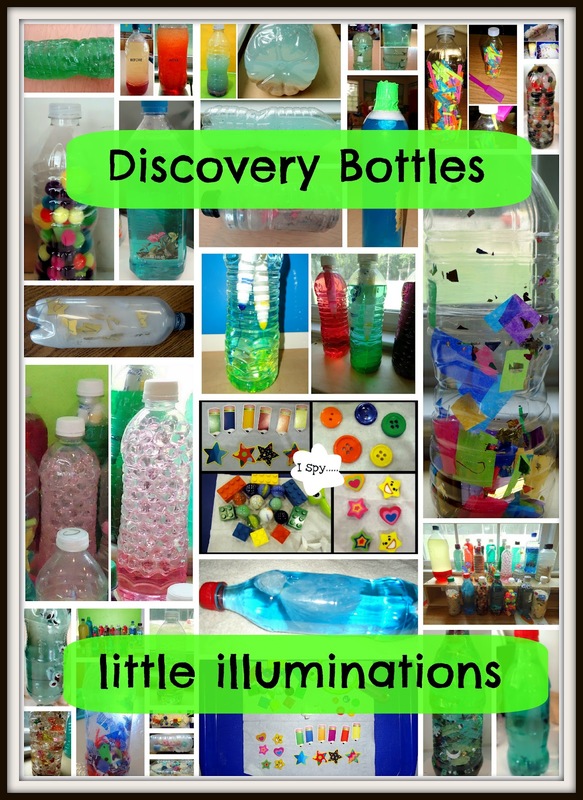 The result was a discovery bottle bonanza for my science center. I just kept getting inspired by all the great ideas out there, as well as being inspired by the bottles I was making! Click here to see my original post on discovery bottles on PreK+K Sharing. I visit our toddler rooms often, to see the little friends and to see what they are up to. (You never know where a great idea may come from!) I've received comments about the reluctance to provide discovery bottles for younger learners because they are often very determined to open them. I saw this bottle while visiting the toddler room and thought I'd share it. This bottle is filled with age appropriate bug manipulatives. There is no "filler" to spill out should the kids decide to explore by opening. One afternoon, I got quite a surprise when two of the afterschoolers (3rd and 5th grade) that share my room in the afternoon called me over to see what they were making. 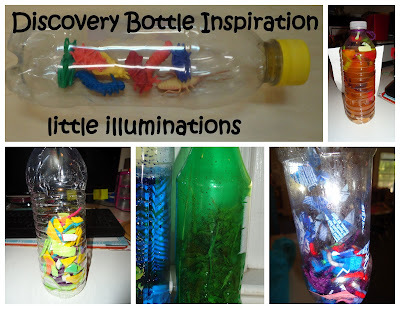 They made a discovery bottle with the plastic water bottle label and some yarn. I think it is a pretty cool bottle, especially since the kids made this completely on their own! One of my preschoolers went home and and got busy while outside playing that afternoon. He grabbed a plastic soda bottle and set about finding interesting things from nature to fill it. When his parents asked what he was making, he proudly proclaimed, " A century bottle!" His parents couldn't figure out what a "century" bottle was until they returned to school and realized he was making a "sensory" bottle! A few days later, I came to work early one morning and found a little display of bottles on my desk. Some were bottles I'd made along with a few new ones. I especially love the notes left with the bottles! "Dear Mrs. Ayn, Please let me know if you want another bottle. If so, I will not be able to give it to you right away, unfortunately. If you are interested, let me know ASAP. P.S. My favorite is the one with the glitter." 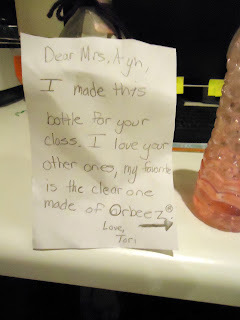 I made this bottle for your class. I love the other ones, my favorite is the clear one made of Orbeez. It really warms a teacher's heart to know that she has inspired kids to take a lesson or idea and have them run with it on their own! 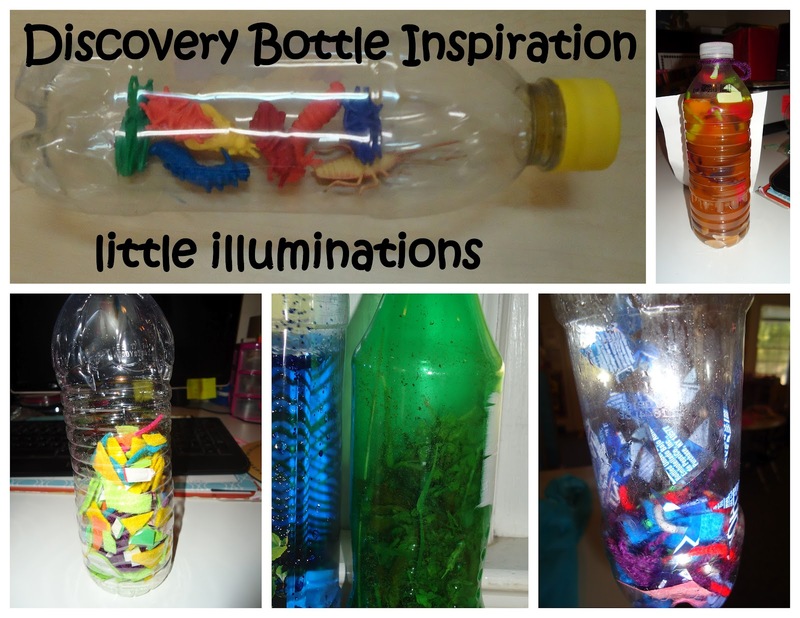 This was especially meaningful since the older kids have become so inspired that making discovery bottles has become a popular activity in the afterschool room, without any prompting from adults!